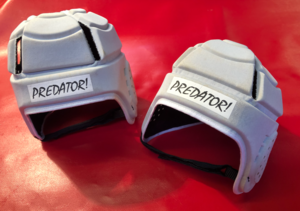 Protect your assets with these Junior Rugby Scrum Caps. A mixed bag of 10 Junior sized Scrum Caps to protect small heads in training and match games. *Adjustable tie at the rear of the cap for secure fit. Suitable for ages 6-10 depending on head size. Items are light grey in colour although we have noticed a slight discoloration on some while in storage, hence the considerable saving against the normal shop price of £27.99 each.